Well, I was sitting third row center (right behind Bob Welch) at the Santa Monica Civic Auditorium on Thanksgiving Night, 1975 when Lindsey said "we've got a brand new song for you that we haven't played publicly before...haven't even titled it, either." After hearing the song, how could they call it anything BUT "Go Your Own Way", I thought?? Yep, by the time I first heard the single on the radio in October '76, I could "name that tune in 3 notes". Although the single sounded quite a bit different than the way they'd been playing it live. And, as I mentioned earlier, they'd played a fetal arrangement of "You Make Loving Fun" at their June 1976 concert at Universal Amphitheatre...so I was vaguely familiar with that tune, too. Oh my goodness . Stevie said that Lindsey wasn't very good at titles (which is why she named Stephanie) but I didn't believe her until now. I can just see him sitting there, scratching his head wondering, "Can I call it Dreams? No, Stevie already used that one . . . "
Of course, Lindsey doesn't understand his own singing (which is why we now have a song called, Right Place to Fade). So, he may not have realized he was saying GYOW 50 times in the song. He might have thought he was saying, sow your own day. Like Alicia, here, my first Fleetwood Mac show was also the Tusk tour, in Houston, Tx. I can't remember the year though.. and will have to do further reasearch there.. LOL.. It was possibly 1980. The scripted shows everyone has been complaining about since 1997 aren't new at all. When did you become ~*jaded*~ about the Rumours lineup? It's no secret you're not a fan of the California kids, so what changed your mind? 1) The decline started when they started scripting their concert sets (as mentioned in previous post), and ignoring tunes from pre-75; but, the Tusk tour kind of rekindled my spirit, since they kept tweaking their sets & mixing up the new tunes during that tour. 4) The invention of the internet & Fleetwood Mac/Stevie Nicks/Lindsey Buckingham message boards. They're good, but they're not the friggin' "geniuses" & "Goddesses" everyone fawns over...maybe back between 1975-80, yeah, but these days, for me, they're done. Basically, all the "Chiffonheads" & "Buckheads" have ruined ANY small bit of appreciation I had left for Buckingham, Nicks and any incarnation of Fleetwood Mac that they're members of. I think that stems from when Lindsey left in '87...they got great players to join (Rick & Billy), the two tours with them were both well received both by fans & critics. Then the 94/95 tour and the new lineup, once people understood that this was the NEW Fleetwood Mac lineup, seemed to like their approach...but then they released Time, which many people at the time who had bought it, LIKED IT; but, the then growing internet message boards started filling up with the incredible hatred for the album "Because it wasn't Lindsey or Stevie, how could it be Fleetwood Mac"...well, there was a Fleetwood Mac BEFORE them and obviously AFTER them....the narrow-minded attitudes combined with the overt fawning just turned me off toward both Stevie & Lindsey. I've grown to hate 'em both...and even the stuff I USED to like, I just loathe these days (due to over exposure, I think, more than anything). Sure, I still have a few private moments when I can listen to TISL or the official GOS and get into them, but those moments are VERY FEW and VERY far between. Last edited by chiliD : 06-18-2009 at 05:20 PM. Seriously - I seem to remember you telling a story about how FM partied with you in the first few rows of some jam fest. Or, they were sitting by you. Something like that. Can you refresh my memory? ...."Blue Water....I sit and I wait for the morning to come...."
...."All the beautiful worlds...that I have seen so far have all fallen down....Ooh, it used to be yours....calm , beautiful ,childlike victim...calm beautiful, childlike victim...."
..."There is a legend passed down through the ages...down through the crystal visions...down through the crystal clear-water fountain...the charmed ones remain...They are mine (you remain...ooh)...."
Where's the Time Machine when you need one? I was 15 years old and visiting a cousin in Los Angeles in August 1977 but had no clue FM was playing there. That Rhiannon from that show was phenominal! My first time was on the Tusk Tour. Its late summer/early fall 1976...I've got tickets to see Eric Clapton (with Charlie Daniels Band as the opening act) at the Forum in LA. Thanks to another buddy of mine having Los Angeles Kings season tickets, I got some prime seats for the show (stage left risers about 15 rows up from the floor about lined up with the 5th row on the floor...would've been about even with the free-throw line if the place was set up for basketball). My friend (John) & I made the journey in my 1967 VW bus (I think Cameron Crowe based his Jeff Spicoli character on me! )...complete with ice box full of Coors 16oz'ers, which wouldn't last long once we got into the parking lot. We make it to our seats just about as houselights go down, Charlie Daniels Band comes on and plays a GREAT set..."How's Clapton going to follow THAT? ", we discuss during intermission. Being red-blooded guys barely in our 20's we're checking out the "scenery" that's around us. I spy a GROUP of HOT (HOT, HOT!!!) "babes" with tall drinks walking UP from the floor. I get the ol' elbow from John, "Hey, check THEM out" he says. As they stop in the aisle about 5 rows down from us to look for their seat numbers before heading into their row, I notice the third one in the line...DAMN! IT'S STEVIE NICKS!!! aisle, a guy just lightly brushes past me...not until he's a few steps down do I realize who it is...RINGO STARR!! After the previous 5 minutes, I am NOT even going to attempt to engage a BEATLE in conversation. Just as I take my seat, the houselights go down, Clapton takes the stage and kicks into "Hello Old Friend". Just before the second verse, I get a tap on my shoulder...its Christine McVie returning my program, signed by Mick, Stevie, Lindsey and herself. (apparently John didn't make the show) The others had just signed their names, but Christine signed it: "Thanks, Steve, XOXO Chris". Well, my friend John & I were just in awe the rest of Clapton's set...Eric was ON FIRE that night, the band was tighter than I'd seen them on previous tours (Eric actually kept the same people in his band for the fourth consecutive tour! )...running through old hits as well as his then new material from his "No Reason To Cry" album. John & I just kept handing each other the program and just staring at it, then looking up to see how Fleetwood Mac was reacting to their buddy Eric Clapton's show. Eric's guitar playing commanded our undivided attention about 1/3 of the way through the show and then as Eric left the stage, we looked around for the Mac and they'd already vacated...probably to head for the backstage party! After Eric's third encore ("Layla" of course! ), the houselights came back up and it was time to go home. 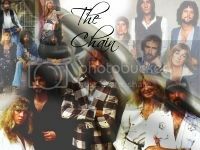 One memorable night that Christine McVie rescued me from years of possible total embarassment with her class & generosity. That's an amazing story chili. WOW just running right into a whole bunch of famous people, huh? How funny. ... running right into a whole bunch of famous people, huh?